Mary Gordon believes in the power of empathy. It can, she says, stop patterns of abuse, draw the curtain on generational cruelty, and create kinder, better worlds—especially if we instill its importance at a young age. That’s why, in 1996, the former teacher, as well as creator of the first Toronto District School Board daycare for teen parents in Toronto, created Roots of Empathy. Her goal: To rid communities of cruelty through teaching children empathy at a young age. Today, volunteers run 2,477 programs in Canada—and worldwide more than 2,000 volunteers have expanded the program to 10 countries. An independent program, Roots of Empathy is designed to fit into any school’s curriculum, and in a variety of subjects: using graphs to facilitate math lessons, for example, or literature to work with language arts. Students, for instance, must imagine themselves making various decisions for the baby. When faced with a problem as simple as what diaper to buy, they are pushed to think: What does this mean for the baby? What does this mean for the parent? What does this mean for the environment? The idea here is to help them understand “emotional literacy”—how to explain what they are feeling. Once they know how to do this, the theory goes, they can compassionately understand how someone else might feel. Scientifically, it makes sense: empathy is something we naturally want to do. Research has shown that “mirror neutrons” make people react to emotions that others produce— similar to recoiling in imaginary pain after seeing someone else get hit by a Frisbee. Teaching empathy in the classroom has been gaining momentum in education, along with the teaching of different “literacies”—a term that now applies to emotion, technology, or even social skills. 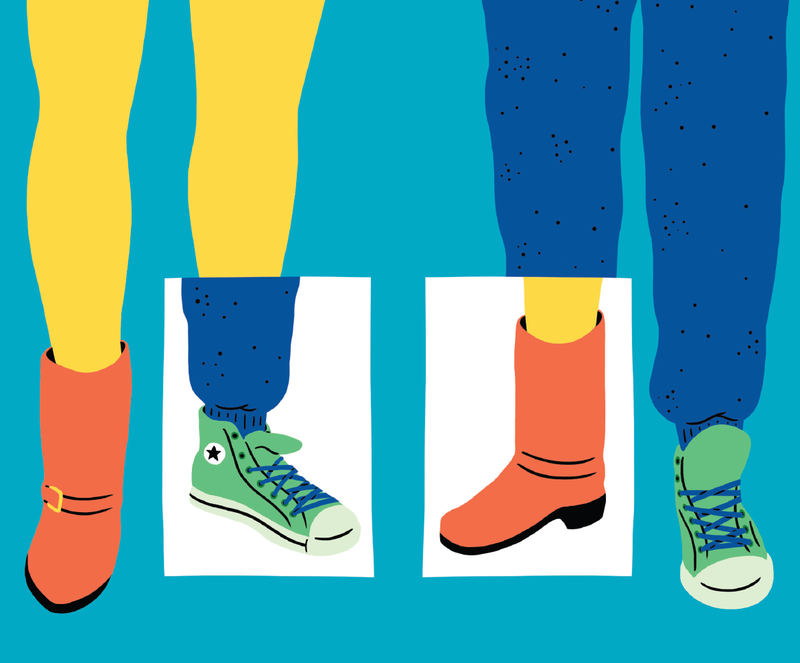 More and more, teachers are encouraging students to put themselves in each other’s shoes. In Ontario’s York Region, a teacher has started resolving student disagreements by literally having them step onto different laminated illustrations of shoes, share their feelings, then switch to put themselves on the other side of the conflict. The picture book, Have You Filled a Bucket Today? has become a popular classroom staple, complete with corresponding lesson plans and school-wide programs. Its lesson: children need to fill, rather than empty, one another’s “bucket” with love, kindness, and empathy. And it doesn’t stop there: The Empathy Factory, founded in 2010 in Halifax empowers youth to make social changes in the world. They do this by touring Nova Scotia delivering workshops that ask students to execute an idea that makes the world a better place. The organization also does work outside of the classroom, including a program called “Accelerating: Empathy,” where 100 high school students from around Nova Scotia are brought together. The students are asked to find a solution to a social issue of their choice, pitch it to the other students and eventually to a panel of judges, who give winners a chance to bring their ideas to life. Everywhere we look, it seems, empathy is gaining traction—reflecting the idea of social change in Canadian communities. Proponents of empathy learning hope that by starting with children, the next generation will promote a more accepting way of life that focuses on celebrating difference. Children learn that each individual in their classroom is different from one another, to value those different experiences, and that although people can never have the same experiences, they can empathize with them. It’s a skill many of us may wish CEOs or politicians had—we could be living in a very different world if, as Gordon says, we had leaders who saw others as they saw themselves. And, in some cases, students are already starting to teach their adult instructors. Marion Kitamura, a trainer at Roots of Empathy for 16 years, was working with a Grade 7 class in 2005 when she got a request from a teacher that went outside the bounds of her usual work. The students wanted to talk about a sad news story: a man had committed suicide by jumping off a bridge in Toronto, carrying with him his 5-year-old daughter. Kitamura expected that they would share some of the same sentiments she’d heard from adults about the story—that they’d hate the father. Blair is a freelance writer based in Toronto. She is a literature, theatre and fashion enthusiast—and tries to bring these into her love of writing whenever possible. She frequently interviews fascinating people for This Magazine's Q&A section. Friday FTW: Chilean indigenous group wins environmental lawsuit against Barrick Gold Corp.